We take ubiquitous WiFi and internet connectivity for granted, from free hotspots at Starbucks and McDonald’s to pay services on airplane flights. The first test of a commercial in-flight WiFi service onboard a spacecraft took place this weekend, on April 29, 2018, with a tweet in real-time from onboard Blue Origin‘s New Shepard suborbital spacecraft. Solstar, a Santa Fe, New Mexico-based firm, flew the Schmitt Space Communicator (SC-1x) for the first time on Blue Origin’s eighth flight. SC-1x was one of a number of commercial — i.e. paying to ride as a service — payloads taken on about a 10 minute ride. 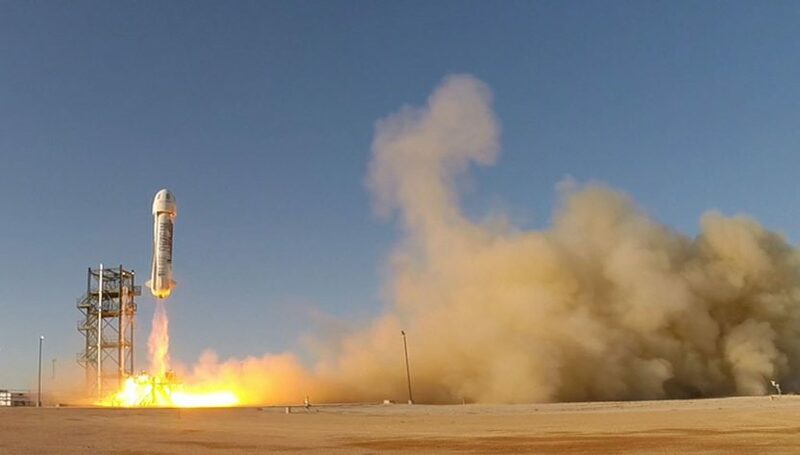 The flight left the West Texas launch pad at around 12:06 PM ET, traveling upward over 350,000 feet — more than 100 kilometers and breaking the “Karmen line” — on a 10 minute, 18 second trip from launch to touch down, with 3 minutes of “micro-G” weightlessness at the top of the ride. The SC-1x is described in various press reports as essentially being a router, but hardened for 3 or more Gs of acceleration to orbit, a period of several minutes of weightlessness at the top of the flight, followed by up to 5Gs force for deceleration before landing. Solstar says it would conduct data transmission tests on the pad, on way up, in space, and back down through landing. Effective data rates haven’t been disclosed on the company’s website, but may be limited to tens or hundreds of kilobytes per second if the company is leveraging an existing satellite broadband service, such as Iridium or GlobalStar’s. NASA is covering Solstar’s flight costs for two Blue Origin rides through its Flight Opportunities program. The agency stands to benefit from being able to integrate real-time communication services into launches, enabling researchers to observe experiments as they happen and adjust parameters in mid-flight during sub-orbit flights. Suborbital spaceflight services are of significant interest for both academic and commercial research with Blue Origin, Virgin Galactic, and others working to provide several minutes of “micro-G” services for experiments at a price tag significantly less than a ride up to the International Space Station (ISS). A short suborbital ride also enables equipment and procedure testing for more complex experiments prior to a launch and longer-duration stay to ISS. This was the second New Shepard flight to carry commercial customers, with plenty of experiments lined up for rides in the future. But New Shepard is designed to carry much more than hardware racks. Blue Origin ultimately plans to fly paying tourists into space. The New Shepard capsule is designed to take up to six astronauts on sub-orbital rides. Competitor Virgin Galactic says it has around 700 customers lined up at anywhere from $200,000 to $250,000 per ticket for rides on its SpaceShip Two. Blue Origin hasn’t started taking flight reservations yet, but hints it may fly people by the end of the year if all goes well in several unmanned flights between now and then. Onboard Solstar WiFi connectivity would enable tourists to relate their experiences in real-time through social media — assuming customers pay for the service, just like we typically have to pay extra for airplane in-flight WiFi. The company hasn’t discussed its full plans, but Virgin Galactic is no doubt on its short list when it starts flying commercial customers.